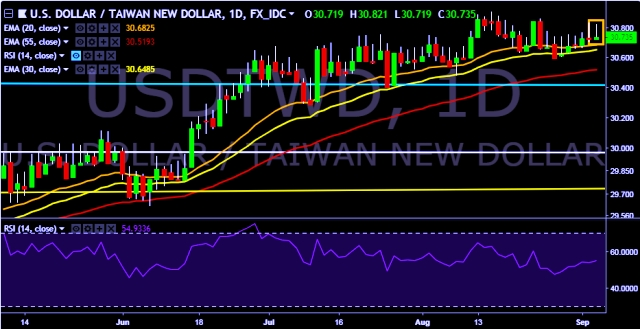 USD/TWD is currently trading around 30.74 marks. It made intraday high at 30.82 and low at 30.71 marks. Intraday bias remains neutral for the moment. A daily close above 30.72 will drag the parity up towards key resistances around 30.90, 31.02, 31.17 and 31.42 marks respectively. On the other side, key support levels are seen at 30.60, 30.47, 30.40, 30.28, 30.15 and 30.05 marks respectively. Taiwan stocks open up 0.2 pct at 11,042.41 points. Taiwan will relase CPI data at 0800 GMT. We prefer to take long position on USD/TWD only above 30.90, stop loss at 30.60 and target of 31.17.